Have you ever wondered about what happens when your landlord doesn’t pay his electricity bill? You get a letter in a rather mean looking envelope telling you about it. I know this because I got just one such letter yesterday. 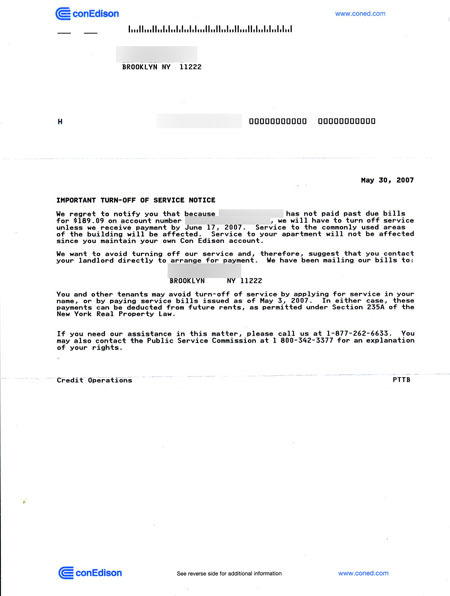 I thought it was very thoughtful of Con Ed to suggest that I can apply for service in my name or pay my landlord’s balance for him. I actually considered doing the latter, but then I realized $189.09 is a lot of money to a schmo like me. Unlike my landlord, I do not own a chain of laundromats in Manhattan. I guess June 17th I’ll find out what will happen next. Given that this building has gone without electricity before and we once went without hot water for an entire week, the prognosis isn’t looking good. P.S. : Con Ed also sent a letter to the Superintendent of our building. He saw fit to return it sender. Actually Jake I can tell you a few things. 1. The landlord is mortgaged up to his eyeballs. He has used this property to expand his business and purchase another building in Queens. 2. There is some talk that he is in trouble for tax evasion, which I find 100% plausible for a number of reasons. 3. He performs no maintenance whatsoever on this property unless ordered by the city to do so. As far as landlords go, he’s a pretty OK guy. He is just in WAY over his head. same issue here. Because we live in the “ground floor” (i.e. illegal basement apartment), we find nice notes from Con Ed on our door. They let us know that if the typical $600-800 owed is not paid in 30 days, the electricity will be shut off for the whole house. The landlord lives in 2 floors of the building. Hmm….I pay my rent on time….so why aren’t you paying the utility companies…?